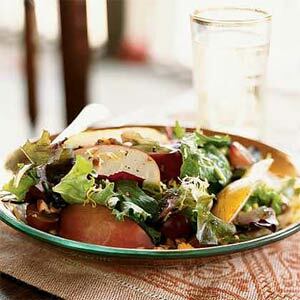 This is a great salad that goes with any meal, or is wonderful on its own. Add some chopped, cooked chicken for a main dish meal. Place apple juice in a small saucepan, and bring to a boil over medium-high heat. Cook until reduced to about 3 tablespoons (about 10 minutes). Combine reduced apple juice, vinegar, oil, salt, and pepper, stirring with a whisk.